I hope someone can help you, I've been waiting for this hack to be finished for a long time. That's right, the NES Dev community. They are much more experienced in 6502 coding as well as making homebrew NES games. One of my Facebook fans via PM including Shane recommend that community to see if I can get my project fixed. But even if they don't, then it's pointless. I am extremely tired and exhausted and there are other incomplete ROM-Hacks projects behind my back. Keep in mind that ROM-Hacking is labour work so it does causes headaches & eye strains everytime I get up early for work. Hell, most people asks me to beta test their games so that's an another waste of my days trying to complete the project. @Kuja Killer, it's best NOT to kill yourself. You already put yourself in harm during the Odyssey project so please don't bother trying to attempt. Admit that it's impossible and it takes weeks to get it perfect. Well, I'm still a noob at this. I'd like to know where is the AI code of Penguin (3B) located in Mega Man 3 if possible. I'd like to either change the travel x distance to 0 when it jumps, or simply remove it. 3AA6D + 3AA72: Low/High byte of jumping power heigth - that determines how far it'll jump. the lower the number, the less distance it goes. there's a bunch more settings like for the eggs but it's kinda complicated though. i assume your only interested in just the penguin so that's all i looked up for now, if you need more info, i'll give more. hey there, i happened to see your videos of my game, Odyssey posted a couple weeks ago on youtube, i just only now found out about them tonight, and wanted to really thank you for that. im guessing you done savestates and slowdown to do "no damage" runs on the levels. hehe that's fine. since December 3rd 2014 and uploading to Youtube, 3 Videos of MMO Playthough *No Damage* (Video Editor with Camtasia Studio not WMM). Shinigami's Graveyard in Necro Man's Map, Demo 4 version of Mega Man Odyssey. -Zombie Joe (similar to Returning Sniper Joe from MM2) not appear in 2nd Levels of Necro Man's Stage. -What Necro Man's Talk Message Text "Necro Placehoider" (skip at 10:23 on YT Title Mega Man Odyssey Demo Part 2). -Energy Balancer (Hidden Secret Room in Ladder) appear in 2nd Levels of Necro Man's Stage. Pyro Man in Demo 4 Like Pluto's Graphics from Mega Man V (GB). Necro Man's Stage for available now in Demo 4, search Mega Man Odyssey Demo 4 uploaded by kuja killer since 2012 (pre-patcher rom .nes not .ips) in Bw*s*(dot)org. You are right, I don't really want to mess up the eggs. Changing the values you mentioned still makes it jump in upon appearing and make 1 pixel distance jumps. So it's not really what I needed. However, I instead NOPed 3AA4E, which is a logical value as I see, and since the AI cannot use a not existing value for computations, it simply disabled the movement. I have not found any problems yet, so I assume it's safe to do this. But it now doesn't wanna throw eggs, only from a short distance. It seems it would be wise to do more than simply disabling movement by doing this. Aww, I should first disassemble the AI for myself, then do something about it, huh. It would be better to have a Disassembly document on the game, I would kind of manage doing things on my own. I'd like to know however, the eggs travel distance. Last view: 74 days @Korxroa Necro Man's stage was released but removed by Kuja Killer himself. Last view: 1293 days Insectduel, what mean? "released but removed". Necro Man's Stage no longer in Demo 5 not Demo 2.
replaced name Necro Man with Ghost Man or Zombie Man? @Zieldak: Hello Zieldak, New MM2 Hack called "Mega Man Reloaded 2" coming in 2015? released Original Mega Man Reloaded back in 2012 (v1.x) and 2013 (v1.3). last downloads 3000+ (not 4000+) on RHDN. And it seems I need some information about the eggs. Hmm. I shall say I'm currently working on Mega Man Crimson, a MM3 hack. I don't have any plans for an MMR2 right now. Insectduel, what mean? "released but removed". huh ? no, necro's still in the game. i dont know what all this "demo 3, 4, 5" stuff is about honestly. but i think i know what insectduel was talking about that. Last year in June 2013...i was so eager like crazy to do a demo again...would be officially the 3rd time. even though sadly i didnt have anything much done... still only 3 stages out of the 8 guys... no wily levels, nothing else. I quickly posted a demo on the japanese 2ch dicussion board, but i felt like i picked a really bad time to post cause i gotten really negative comments ...so then i immediately deleted it and didnt ever say anything for months. nor did i ever chose to talk about it at all. i cant really explain it very well. Last view: 206 days Okay. Well, I'd like to move the Giant Metool miniboss from Needle R (Room 15) to Needle Man's stage (Room E), the enemy is there, but it doesn't rise up as it does normally. So what do I have to change to activate the miniboss correctly? 25563 - Y position of how far up the metool will travel. Rarely EVER goes way up the screen cause of how ridiculously random it is. 25572 - Same thing as 25563, but how far "down" he's allowed to go. 25630 - X position of where the metools will appear on the screen. Doesn't have to just be the giant metools mouth if you wanted. That's a lot of info... Thanks! By the way, are you searching for these when someone asks it, or you have documented these? I am one of the lamest ROM-hack creators ever, I don't even know how you find these values and all. Last view: 3 hours these are still mostly all notes i jotted down myself around 2007. so i just copy-pasted them here. except the "level setup" offsets cause i didnt have those noted down anywhere. so i did have to look that up after seeing your post. All the settings below that like speed of metools and the all that stuff it does, that was in the "boss database" document i wrote up years ago, and posted here on acmlm a few times. Last view: 74 days Japan already hit it's mark to a HAPPY NEW YEAR. Ever heard of a new Rockman game from PureSabe called Rock52015NY? You should try this out just for entertainment. Yup i saw his twitter said "website was updated" so i went and checked his front page, says he made a small little hack just like last year. A fun little Rockman 5 "new years" hack. I wont say what it is (no spoiler) -- but i loved it. Took me 10-15 tries to beat it. And cloud platform, so you mean just automatically start doing the flying up thing immediately ...not "when megaman gets near it" right ? it'll start coming up immediately without "waiting for mm" stuff. 38F9A-39043: This is the whole AI for the cloud flying stuff. 39044-390A5: This is the part that spawns a new cloud. The only thing I figured out that it uses a data table for something that moves Mega with the platform (however it can be fixed up a bit, to work better), and the X location where it spawns. And silly me finally knows how to locate data in the rom. So here comes the question. Would it be possible to make more TSA properties (or edit existing ones) to reproduce the same (or similar) effect? It would be nice to have a feature like this, but I'm not good at this. It isn't be hard (except for me) to program it I think, since all it does is when Mega is on it, it decreases or increases Mega's X location at a given speed. Anyone? EDIT: As I see ID 8B, 8C and 8D has similar effect in-game. 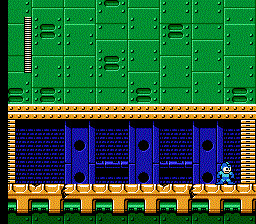 After some time when Mega lands on it, it starts pushing MM to the Right, until he jumps or runs to the left, or when it stops itself. Interesting. It is also possible to stay on the air for some time. Maybe Capcom wanted to implement it or this is a working-like-this-for-some-reason-junk enemy? Last view: 1293 days Skip Doc Robot's Stage in Rockman 3? No Doc Robot's Stage Like RetiredBrony's MM3 Hack called MLP: DDC. Last view: 206 days Okay... Soo... I've been reading this-and-that here-and-there, I'm starting to understand it a bit. It's not THAT hard but it is not easy either to understand. NOP these, it means it won't override the Y coord value it has in the enemy data right? In Cloud Platform's AI, this subroutine loads the sprite right? I think I don't really want to mess with this code. But I haven't checked or "tested" it yet either. Gah, it would be better to start this from scratch, but I don't even know what am I doing. So here comes the question... or something. If I'd like to make a Floating Platform, which after it's spawned, will go up umm... 30 hex (48 pixels) with decreasing speed to 0 when it reached Ycoord+30 and then from that location back to the spawnpoint with increasing speed, and from there down by 48 pixels with the same decreasing speed, what would I have to do? First I'd need to load the values the AI needs, store these values where they belong, and load the sprite with the subroutine right? Then umm... This is where I'm shot. I don't know what to do or program next. So I need some instruction. Oh, and another annoying question, the HP value of the enemy can be used/loaded for a Branch code, making two different sub-types for an enemy (HP=00 is after spawn start going up /or/ move vertically; HP=01 after spawn start by decreasing height /or/ move horizontally) right? Sorry if I'm annoying, but I'm finally getting interested in ASM somehow. I think this might prove to be useful to you Zieldak! It's certainly done a lot for me whenever I had to re-route something. Generally speaking, if there's a JSR to an address higher than $C000 it's a common function, since $C000-$FFFF is fixed to the last two banks of the PRG ROM, so routines with parts that have to be available at any time must sit here. For example, to play a sound effect, it jsr-s to $F... something (can't remember off the top of my head) with the sound ID in the A register. The code switches $8000-$BFFF to the right sound engine banks, and then jsr-s to $8000 and lets the engine do the rest. Once it's done initiating the sound effect, it returns, puts back the old banks to $8000-$BFFF and things move on. Last view: 1293 days Problem 2nd Boss Door like without Beat Doc Robot defeated. Fix 2nd Boss Door is closed (Beat the Doc Robot defeated) in Doc Robot of Needle Man's Stage Room ID 5? JP version of Rockman 3 not Mega Man 3. MySQL - queries: 106, rows: 146/0, time: 0.139 seconds.